London Philharmonic Orchestra/Sir Adrian Boult. 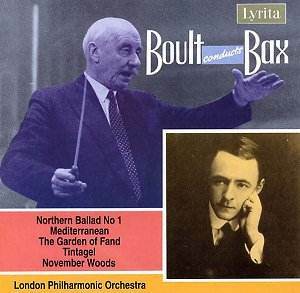 When Lyrita first issued these performances in the 1970s, Boult almost had the market for Bax tone poems cornered. Now, in 2006, these performances have to jostle with competitors in the catalogue. Bax wrote so much excellent music, that no two compilations of his tone poems need to be alike. However, at least two other discs offer alternative performances of the "big three" tone poems � The Garden of Fand, Tintagel and November Woods � to those gathered here. David Lloyd-Jones on Naxos adds to this mighty triumvirate the later Sibelian tone poem, The Tale the Pine Trees Knew, on his competing disc (Naxos 8.557599). Bryden Thomson also stakes a claim on this territory. His Bax symphony cycle may be out of the catalogue � although Chandos has made each disc available for download in mp3 format from the Chandos website for the price of a Naxos CD � but his disc of the big three, coupled with the less powerful Summer Music, remains in circulation at mid-price (CHAN 10156X). I should also note that I have not heard Vernon Handley's recent disc of Bax tone poems (CHAN 10362). That disc includes two out of the big three, but omits Handley's Tintagel, which is only to be had as part of his 2003 boxed set of Bax symphonies (CHAN 10122). The first of the big three is The Garden of Fand, an evocation of the sea that dates from Bax's early fascination with all things Irish. Though richly scored, its fabric is delicate. Lloyd-Jones and Boult pace this tone poem similarly, Lloyd-Jones taking [16:32] to Boult's [16:37]. Neither conductor wallows in the detail of this luscious music. Lloyd-Jones, however, seems to find more forward momentum and presents the score in long instrumental lines. Boult, who gave this score its British premiere, is more episodic in his approach and allows the orchestration to speak for itself. The Scottish orchestra on Naxos is in better form than the London Philharmonic, but Boult's ensemble achieves a clarity of texture that makes his argument easy to follow. His tempo fluctuation is much more pronounced and he is more likely to push forward, only to draw back for Bax's big, swirling string melodies. He is also afforded the superior recorded sound. You could say that Lloyd-Jones is more concerned with flow, Boult with ebb and flow. I prefer Lloyd-Jones, but only just. Tintagel is probably Bax's most popular work, and the entry point to his oeuvre for many a listener. It was composed in a passionate blur after Bax and his mistress, the pianist Harriet Cohen, ran away to Cornwall in 1917. His own romantic situation, the dramatic Cornish coastline and the majestic ruins of Tintagel castle sparked resonances for Bax with his beloved Wagner's Tristan und Isolde � which of course is based on an ancient Cornish legend and is as Celtic a love story as you will find. This tone poem, part sea picture, part evocation of dimly remembered heraldry, was the intoxicating result. As with The Garden of Fand, Debussy's La Mer is an obvious influence, and there are also touches of Wagner � not least some thematic references to Tristan. This music, though, is unmistakably the work of Bax and of no other composer. Although he is not entirely scrupulous in his observance of tempo markings, Boult offers here the sort of performance that I would expect from Boulez, were he minded to conduct British music. There is a certain lack of emotional engagement, but the playing Boult gets from the orchestra, the balancing of parts and the textual clarity he achieves are a joy to hear. This is not a faultless performance. The climaxes are wonderfully evocative and rousing, but the development passages can sound perfunctory and the orchestral playing tends to blandness. Boult does not ratchet up the tension in the way that his pupil Douglas Bostock does in his passionate account (ClassicO CLASSCD 254 � see review), and Lloyd-Jones is also more engaging and urgent throughout, though his climaxes do not hit home as powerfully as Boult's. It is in the last of the big three that Boult really demands collectors' attention. November Woods was written not long after Tintagel was first sketched out, but its mood is much darker. There are those who see this tone poem as Bax's comment on the Great War. The musical allusions in the score pointed out by Lewis Foreman in his excellent liner notes certainly seem to support this view. Boult's performance of November Woods is the most brooding and atmospheric I have heard. Lloyd-Jones knocks a couple of minutes of Boult's time, but while his performance is also excellent, his urgency comes at the expense of mystery. Boult is much darker and he elicits fabulous playing from the London Philharmonic. There is no trace of routine here, and the brass and whooping horns are magnificent. In the common works, then, Lloyd-Jones scores over Boult in the two sea pictures, but concedes to the older conductor in November Woods. What of the fillers? Bax wrote three Northern Ballads but, for reasons that are lost on me, none has really gained much currency. The first of them opens this disc. The sound-world of the music is immediately Baxian, but the orchestral textures are leaner and the colouring more precise than in the earlier works. This tightly constructed work is clearly informed by Bax's experience as a symphonist. There is more Sibelius than Debussy in the mix this time and the thematic material has a pronounced Scotch snap. This performance features stellar contributions from the brass � trombones in particular. In fact, the whole orchestra sounds brilliant here and Boult shapes the music with mastery. Mediterranean, in contrast, is a light snack � tapas, if you will. Short and colourful, it sounds like Waxman channelling Bax for the score of a film set on the Costa del Sol. Not a masterpiece, but here it makes for a charming interlude between the late Northern Ballad and the first of the big three. As hinted above, this disc is wonderfully recorded, and that alone may be reason enough to justify purchasing this disc. Bax's orchestral textures tend to be thick, and an over-reverberant acoustic or unhelpful recording balance can make even the most committed performance sound turgid. Not so here, with every instrumental line cleanly caught. This does have its disadvantages, though. The spot-lit percussion in Mediterranean is distracting, and the clarity is unforgiving of any minor orchestral imprecision that might otherwise have passed unnoticed. I have listened to this disc repeatedly since receiving it for review and will continue to do so with great pleasure. It opens with Northern Ballad No.1 and closes with November Woods � two fantastic Bax recordings � and affords many joys in between, minor shortcomings notwithstanding. If you are looking for a first disc of Bax tone poems for your collection, and one that includes the "big three", I would recommend Lloyd-Jones ahead of Boult overall, but only just. For more seasoned Baxians, though, Boult's November Woods is essential and his insights in the other items well worth hearing.